The solution: We’ve rounded up some of our favorite healthy holiday treats that contain significantly less sugar and calories than their more fattening counterparts. 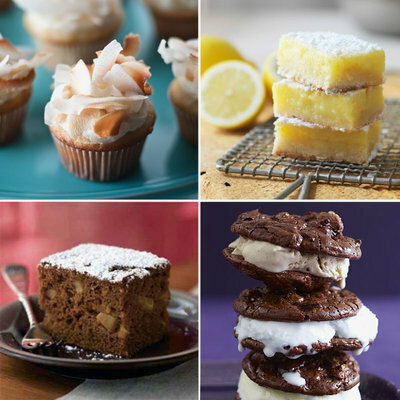 From whole-wheat sugar cookies to chewy lemon bars to moist holiday cakes, there’s something for everyone on this list. The best part? All of these treats are packed with flavor, thanks to better-for-you ingredients like ground cinnamon, dried cherries, low-fat yogurt, pure pumpkin, and fresh ginger—in other words, no one will notice that they’re actually munching on healthier cookies and cakes. Happy baking! There’s a reason these cookies are a classic——they satisfy your sweet tooth while only costing 126 calories per cookie. Get the family involved by gathering around the kitchen counter to decorate with festive icing and sprinkles! Everyone will love this white chocolate twist on bark. It’s packed with heart-healthy, antioxidant-rich dried cranberries and almonds. Try this refreshing citrus dessert when you’ve hit your chocolate and peppermint limit. Just start with basic cookie dough and add some lemon zest. These treats will be gone from the holiday dessert table in no time. These holiday cookies taste so decadent Santa will never know they’re packed with whole wheat, fiber-rich oats, and omega-rich walnuts. Don’t forget to leave a glass of milk out as well. Shhh. Don’t tell anyone our version has a fraction of the fat and calories of a traditional praline. Even better, they last up to two weeks in an airtight container. You’ll love starting a new (and guilt-free) holiday tradition with this festive cake. Low-fat ice cream cuts the saturated fat and cholesterol by more than half, making this frozen treat much healthier than you’d expect. Top this fruity dessert with cranberries for a low-fat, antioxidant-rich dessert. Use Bosc or Comice varieties—they’re in peak season in the fall and winter. These snowballs are easy to make with your favorite brand of packaged sugar cookie dough, or dough you create yourself. Adding in some crushed peppermint candies makes them extra festive for the holiday, and the minty smell may actually help you eat less. Read the full list here at Health.com. Check out the new Fit Radio Holiday station here for the perfect tunes to get you in the Holiday spirit both inside and outside the gym!